Burger Joint, originally uploaded by ultraclay!. 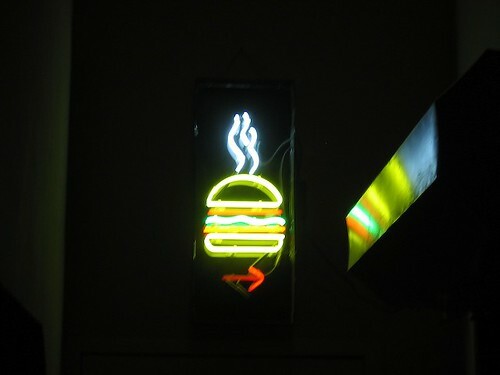 This is Burger Joint, in the basement of the Parker Meridian. It’s a great, no-frill’s burger shack hidden deep in the heart of one of New York’s fanciest hotels. There is absolutely nothing fancy about this place. The menu lists 5 options: Hamburger, Cheeseburger, Grilled Cheese, French Fries or a Whole Pickle. The tagline is “If you don’t see it we don’t have it.” The fries are served in a brown paper bag and they stock one beer, Sam Adams, by the glass or pitcher. I’m rarely up at 57th Street, so I don’t get these tasty burgers nearly often enough. I think it’s been 2 years since my last fix. Shake Shack opens this week, but I’m sure the lines will be ridiculous. Maybe I’ll head up here next time I’ve got a craving. I’m sure the train ride to 57th and back would still take less time than standing in that line.